Contributor - Becky Campbell of Sewforever Quilting. In addition to inventing Innovative Appliqué and Sewforever Quilt Storage, Becky is a gifted designer. "I have been sewing since I was young. Quilting has become my favorite form of expression. There is always something new; new fabric, new thread, new tools, new products and new techniques." The art of appliqué can be intimidating if you're a beginner, but Becky Campbell of Sewforever Quilting has the solution to flawless appliqué for any level of quilter. 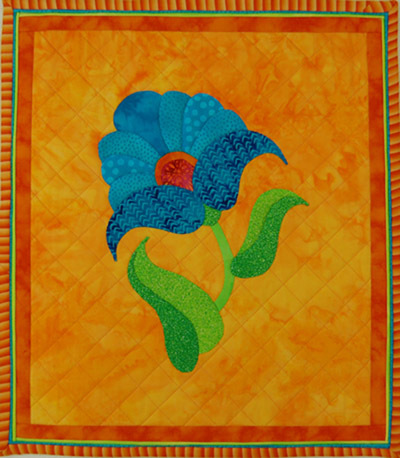 Her Innovative Appliqué is used in the free pattern she provides here. What a beautiful block! Please take a look at her site, where you'll find more about Innovative Appliqué and also about her amazing seamless Sewforever Quilt Storage solution, that will allow you to store your quilts indefinitely without creating creases from folded edges.